I draw from life weekly at Swansea Print Workshop, working with a range of professional artists and models of all ages and shapes including a young male serving soldier and a retired female scientist covered in tattoos. 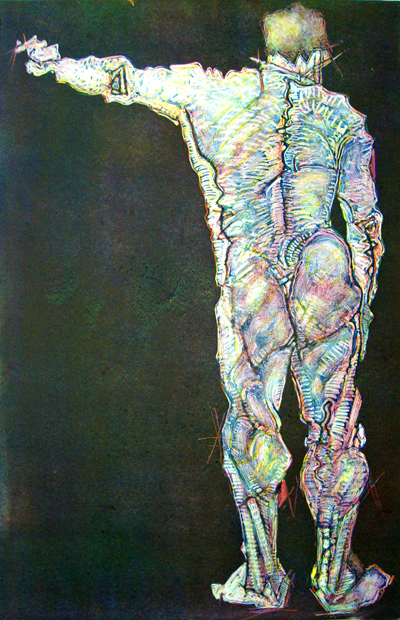 Life drawing underpins my artistic practice and inspires me to develop the images into other genres, especially this monotype process which is an advanced and complex method of producing a unique artwork. The image is redrawn three times in three different colours – yellow, red and blue and the prints overlaid – or stacked – to give a final full-colour image. As with all monotypes the image is unique, although a ghost image can be taken with the remaining ink on the plates. Some artists then work into the ‘ghosts’ with pastels, particularly Degas, who used ghost monotypes as the basis for pastel paintings, like his Ballet Dancers and Bathers. To buy any of these prints please click on the individual artwork and email me with your contact details.